Why Is Website Structure Important? Your website structure is one of the most important on-page SEO factors because it affects SEO and user experience. This will have a major impact on how well you rank. When search engines crawl your site, they organize information by indexing your site. This index includes your content (keywords and locations) and other aspects of pages such as pictures, videos, and date published. When a search term is entered the search engine searches every page that includes the search term and serves up what it thinks is the most relevant. A properly structured site, silos content into associated groups. The more content you create around these groups, the more likely you are to rank for keywords associated with these groups or what I like to call categories. These categories also help users navigate your site. Picture eBay with nothing but products. It would be difficult to find related products. You could use the search function or possibly the related products at the bottom, but without category pages, it would be a mess. 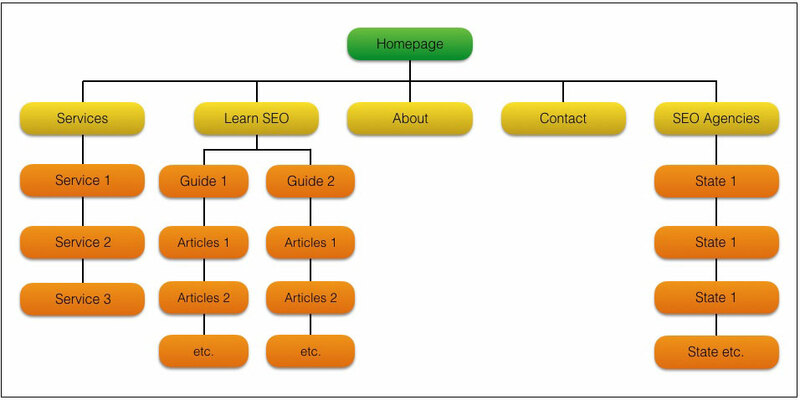 How Site Structure Can Improve SEO and User Experience. Improves how well search engines understand the purpose and intent of the content. Improves how well search engines find and index your most important content. Improves how well you can effectively target keywords. Improves user’s ability to navigate your site. Improves the flow of link equity to relevant content on your site. 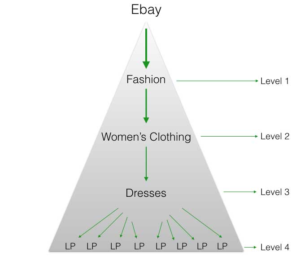 In my previous article “What Are SEO Keywords And Do They Really Matter Today?” I used eBay as an example of how keywords are used in the site structure. For eBay to rank for many different keywords and categories, they must link each product to the correct category. For example one of the major categories is “Fashion.” Once you click on fashion, you have subcategories. One of the subcategories is “women’s clothing.” Under that category, you will see more options. One of the categories is “dresses” (women’s dresses). Under dresses, you will find the landing pages for each product. Picture it as a pyramid. The home page of eBay is the brand. Each of the levels is an opportunity to rank for keywords and each level down is a little less competitive because the keywords they can rank for become longer better known as long tail keywords. Here is the search volume for each level “keyword” according to Google Keyword Planner. But this is just the tip of the iceberg. They could rank for branded terms such as eBay dresses, eBay fashion, etc. They could also rank for non-branded terms such as women’s dresses, fashion dresses, etc. Then there is “level 4” or product pages. These include designer names, seasons, cuts, etc. So now they can rank for keywords such as Spring Chiffon V-neck Dresses, Women’s Long Sleeve Bandage Bodycon Evening Dresses, etc. How Content Affects Site Structure. Articles I write on my blog are about SEO. Imagine I have ten new articles on “Local SEO” and I have published them on my website. Now I need to help search engines understand which is more important or they could compete with one another for keyword terms. Think of it as the table of contents of a book. You need to organize the content. Some of the articles will be longer than others or focus on one subject. You will link the articles (using keywords) when one article better explains a topic so a user can visit the related content for more information. It builds a hierarchy within the structure of the site. Don’t go crazy with this there is no perfect structure. Use common sense and have a plan before you start. How to Develop a Good Site Structure. When creating a site structure, it’s best to map it out first. If you have an existing site, start by mapping out the current structure. You can do this on a notepad or use program such as Google Docs or Keynote. Let’s take a look at my current site structure. The structure doesn’t include internal linking, and you can see I haven’t included my blog. For demonstration purposes let’s say I have a blog with 20 posts. How should I categorize them? First, I would have the blog homepage that would be in the navigation bar. Next, I would create the categories I’m writing about. Then I would list the appropriate categories. For example, if one of my articles is about “Keyword Research for Local Businesses” and I have category pages for “Keyword Research” and “Local SEO” I would list them in both since it is relevant to each category. You can see I’ve categorized two of the articles according to the type of animal. The third article “How to Care for Your Pets” is listed in both categories since this article would target different articles including both cats and dogs. Remember the whole point of site structure is to combine all relevant content to make it easy for search engines to understand and users to navigate. Simple Guidelines for Site Structured. Keep your content within four clicks of the home page. Don’t associate your article with more than three categories (looks spammy). Only link when it adds value for the user. Use short tail keywords as category names. Four to seven categories for a smaller blog possible more for a larger one.